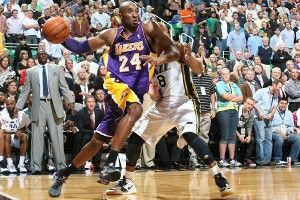 Randy Foye hit five 3-pointers to lead the Jazz to a 95-86 win over the Lakers, who are now 1-4 on the year. After the loss, Dwight Howard embraced head coach Mike Brown in the locker room and gave him some words of encouragement. “I appreciate that, Dwight,” said a clearly moved Brown, who then walked to the media room with a bull’s-eye taped to his back. NHL owners met with the players’ union Wednesday for more than five hours of negotiations on topics like revenue sharing and honoring existing player contracts. “Look, we’re willing to not not not share revenues with you,” said commissioner Gary Bettman, attempting to confuse the other side with the bold “triple negative” negotiating tactic. “We don’t not anti-agree,” a player’s lawyer replied, and the two sides stared at each other suspiciously for several minutes before talks resumed. Bobby Petrino’s father told a Louisville newspaper that his son is interested in becoming Kentucky’s head football coach. The elder Petrino went on to say that his son trusted him to interview graduate assistants, and that they should probably get the process under way just in case anything came of it. An 83rd-minute goal gave Glasgow Celtic a stunning 2-1 win over Barcelona in Champions League action. Some experts attribute the result to the psychological trauma of trying to say the words “Glasgow Celtic” with a Castilian lisp. High school quarterback Jalan McClendon was ejected from his team’s first-round playoff game for imitating Cam Newton’s “Superman celebration.” In a strange coincidence, another student at McClendon’s school was suspended earlier in the year for sneaking in after hours and imitating Cam Newton’s “Laptop celebration” in the computer lab.